One evening in 1971, the record salesman Wolfgang Ambros meets with friends at the Theseus temple in Vienna and sings his songs - including Da Hofa, a poem set to music by Joesi Prokopetz. A customer in the record business persuades her friend to promote Ambros' music: Together they go into the studio of Austro top producer Peter Müller and record the Hofa demo in two hours. For 6,000 Schilling production costs (approx. 436 Euro) the revolutionary single will be produced later, which will only be broadcast on the radio after an initial "shock effect". When Ambros appeared on Peter Rapp's TV programme 'Spotlight' at the Ronacher in December [former Vienna City Theatre; after the Second World War it was the alternative stage for the Burgtheater, which was badly damaged and burnt out by bombs; after five years Varieté artists performed there again before the ORF settled in 1960 and used the premises for TV productions; editor's note], the title was number one in the charts and sold over 30,000 copies. In Austria, this song is generally regarded as the initial spark for a music landscape in the pop genre that had hardly existed until then, or for the singer-songwriter scene, which mainly operates in the Viennese folk club Atlantis. With the release of his debut album 'Alles andere zählt net mehr ...' in February 1972 Wolfgang Ambros, born 1952 in Wolfsgraben in Lower Austria, confirms the success of Da Hofa; with the 1975 LP 'Es lebe der Zentralfriedhof' - inspired by a poster '100 Jahre Zentralfriedhof' in front of its main gate in Vienna - Ambros achieves his final breakthrough. In the same year the singer first became aware of Bob Dylan. 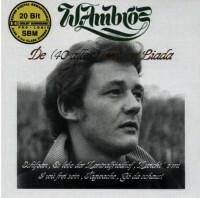 The album 'Wie im Schlaf' (1978) with songs of the self-proclaimed "Song and Dance Man" finally brought Ambros his breakthrough in Germany. The year before, however, the mood at Ambros had been anything but good - documented on the album 'Hoffnungslos': a depressive work with dark lyrics and song titles like Wie wird des weiterh'n, Hoffnungslos, I bin miad, De Höld'n san scho alle tot and Minderheit. Ambros reached his artistic zenith with the LP 'Weiß wie Schnee' (1980) and the radio play 'Augustin - eine Geschichte aus Wien' (1981). Customer evaluation for "De 40 (aller)best'n Liada (2-CD)"